, a learned English divine, and able antiquary, was born at Manchester, about 1735. He went early to Oxford, where he was elected fellow of Corpus Chrisii college, and where he discovered, in a very short tune, those fine originalities, those peculiarities of rniiui, which afterwards so strongly marked him as an author and as a man. He took the degree of‘ M. A. 1759; and proceeded B. D. 1767. His uncommon vigour of intellect at once displayed itself among hisacquaintance but, whilst his animated conversation drew many around him, a few were repelled from the circle by his impatience of contradiction (a failing which frequently accompanies powers like his), and by the consciousness, his biographer thinks, of their own inferiority. The character of his gepjus, however, was soon decided in literary composition. In 1771, Mr. W. published the first volume of his “History of Manchester,*’ in quarto; a work which, for acute* ness of research, bold imagination, independent sentiment, and correct information, has scarcely its parallel in the literature of the country. Nor does its composition less merit our applause, whether we have respect to the arrangement of the materials, the style, or the language. In some passages there is” supreme elegance;“in others a magnificence of thought, a force of expression, a glow of diction, truly astonishing. The introduction of Christianity into this island, in particular, is uncommonly beautiful. 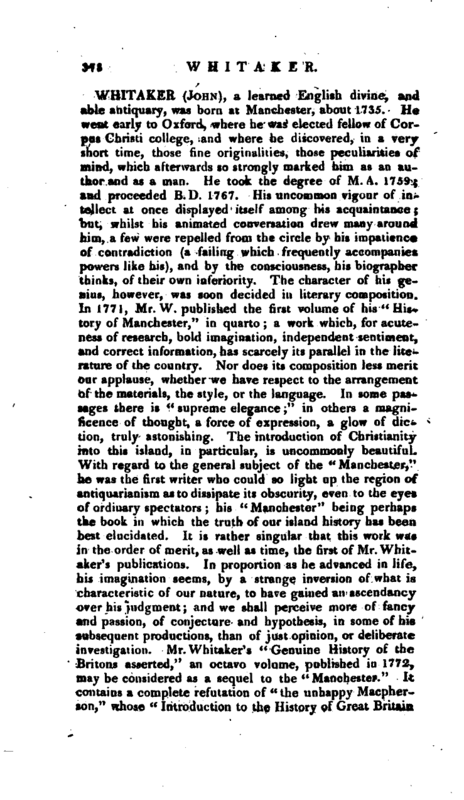 With regard to the general subject of the” Manchester,“he was the first writer who could so light up the region of antiquarianism as to dissipate its obscurity, even to the eyes pf ordinary spectators; his” Manchester“being perhaps the book in which the truth of our island history has been test elucidatedr It is rather singular that this work was in the order of merit, as well as time, the first of Mr.Wbitaker’s publications. In proportion as he advanced in life, his imagination seems, by a strange inversion of what is characteristic of our nature, to have gained an ascendancy pver his judgment; and we shall perceive more of fancy and passion, of conjecture and hypothesis, in some of his subsequent productions, than of just opinion, or deliberate investigation. Mr. Whitaker’s” Genuine History of the Britons asserted,“an octavo volume, published in 1772, may be considered as a sequel to the” Manchester.“It contains a complete refutation of” the unhappy Macpherson,“whose” Introduction to the History of Great Britain | and Ireland" is full of palpable mistakes and misrepresentations. In 1773 we find Mr. Whi taker the morning preacher of Berkeley chapel, London; to which office he had been appointed in November, by a Mr. Hughes; but in less than two months he was removed from that situation. 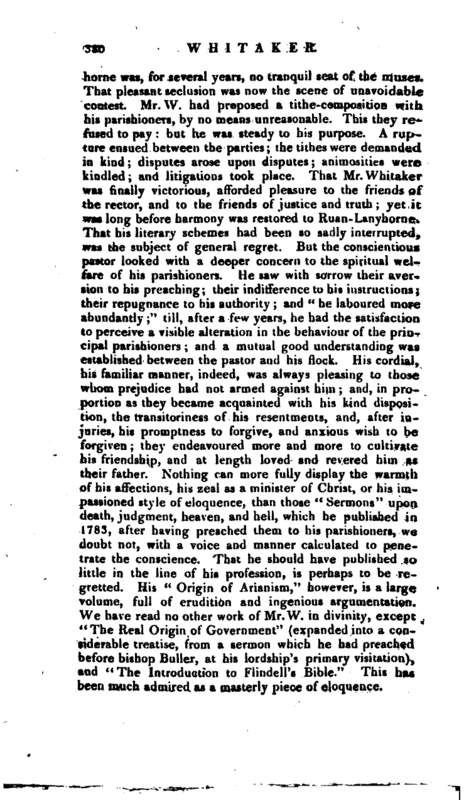 This gave occasion to “The Case between Mr. W. and Mr. Hughes, relative to the Morning Preachership of Berkeley Chapel;” in which Mr. W. declares himself “unalterably determined to carry the matter into Westminster-hall.” But the fervour of his resentment threw him off his guard; and he expressed himself so indiscreetly, that his Case was considered as a libel by the Court of King’s Bench. During his residence in London, he had an opportunity of conversing with several of our most celebrated writers; among whom were Dr. Johnson, and Gibbon, the historian of the Roman Empire. It does not appear, indeed, that Johnson was much attached to Whitaker. Both strong in understanding, equally tenacious of opinion, and equally impassioned in conversation, it is not probable that they should amicably coalesce on all occasions. In the Ossianic controversy they were decidedly hostile. With Gibbon Mr.Whitaker was well acquainted; and the ms. of the first volume of “The Decline and Fall of the Roman Empire” was sub r rnitted to his inspection. But he was greatly surprised when, as he read the same volume in print, that chapter which has been so obnoxious to the Christian world, was then first introduced to his notice! 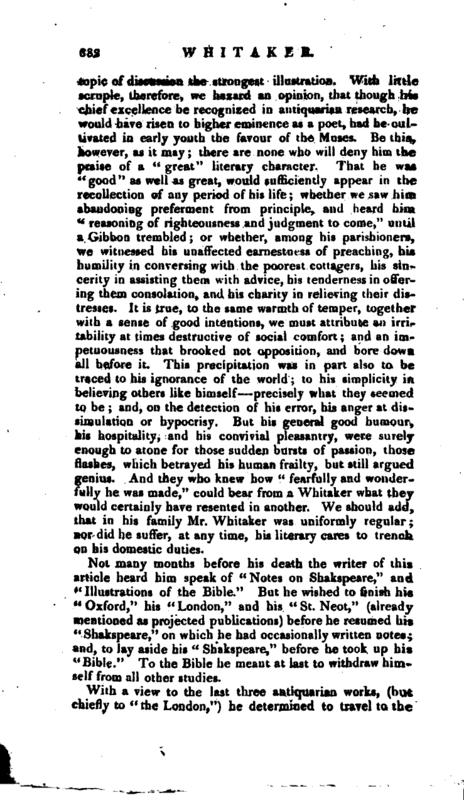 That chapter Gibbon had suppressed in tjie ms. overawed by Mr. Whitaker’s high character, and afraid of his censure. And, in fact, that the deist should have shrunk from his indignant eye, may well be conceived, when we see his Christian principle and his manly spirit in the rejection of a living of considerable value, which was at this time offered him by an Unitarian patron. Of his integrity, however, some recompense was now at hand: and about 1778, he succeeded as fellow of Corpus Christi college, to the rectory of RuanLanyhorne, one of the most valuable livings in the gift of that College; and into Cornwall he went, to reside upon his rectory. 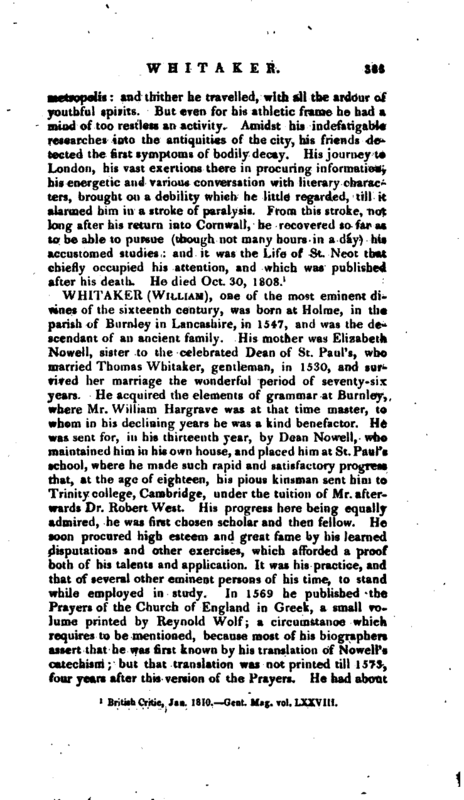 There, it might have been expected that retirement and leisure would greatly favour the pursuits of literature; and that, though “the converser” (to use an expression of Mr. Whitaker’s) had disappeared, the author would break forth with new energies. But Ruan-Lany-r | home was, for several years, no tranquil seat of the muses. That pleasant seclusion was now the scene of unavoidable contest. Mr. W. had proposed a tithe-composition with his par shiontTs, by no means unreasonable. This they refused to pay: but he was steady to his purpose. A rupture ensued between the parties; the tithes were demanded in kind; disputes arose upon disputes; animosities were kindled; and litigations took place. That Mr. Whitaker was finally victorious, afforded pleasure to the friends of the rector, and to the friends of justice and truth; yet it was long before harmony was restored to Ruan-Lanyhorne. That his literary schemes had been so sadly interrupted, was the subject of general regret. But the conscientious pastor looked with a deeper concern to the spiritual welfare of his parishioners. He saw with sorrow their aversion to his preaching; their indifference to his instructions; their repugnance“to his authority; and” he laboured more abundantly;“till, after a few years, he had the satisfaction to perceive a visible alteration in the behaviour of the principal parishioners; and a mutual good understanding was established between the pastor and his flock. His cordial, his familiar manner, indeed, was always pleasing to those whom prejudice had not armed against him; and, in proportion as they became acquainted with his kind disposition, the transitoriness of his resentments, and, after injuries, his promptness to forgive, and anxious wish to be forgiven; they endeavoured more and more to cultivate his friendship, and at length loved and revered him as their father. Kothing can more fully display the warmth of his affections, his zeal as a minister of Christ, or his impassioned style of eloquence, than those” Sermons“upon death, judgment, heaven, and hell, which he published in 1783, after having preached them to his parishioners, we doubt not, with a voice and manner calculated to penetrate the conscience. That he should have published so little in the line of his profession, is perhaps to be regretted. His” Origin of Arianism,“however, is a large volume, full of erudition and ingenious argumentation. We have read no other work of Mr. W. in divinity, except” The Real Origin of Government“(expanded into a v considerable treatise, from a sermon which he had preached before bishop Buller, at his lordship’s primary visitation), and” The Introduction to FlindelPs Bible.“This has been much admired as a masterly piece of eloquence. | In the mean time the antiquary was not at rest. His” Mary, queen of Scots,“published in 1787, in three octavo volumes; his” Course of Hannibal over the Alps“his” Ancient Cathedral of Cornwall;“and his” Supplement to Polwhele’s Antiquities of Cornwall;“furnish good evidence of an imagination continually occupied in pursuits which kindled up its brightest flame; though not always of that judgment, discretion, or candour, which (if human characters had been ever perfect) we should have expected from a Whitaker. But not even here were his antiquarian stores exhausted.” The Life of St Neot,“”The History of Oxford,“and” The History of London," were works all at once projected, and no sooner projected than executed in imagination, and more than half executed in reality. In criticism, (where writing anonymously he would probably have written with the less restraint) we find him for the most part candid and good-natured, not sparing of censure, yet lavish of applause; and affording, in numerous instances, the most agreeable proofs of genuine benevolence. Even in the instance of Gibbon, where he has been thought severe beyond all former example, we have a large mixture of sweet with the bitter. 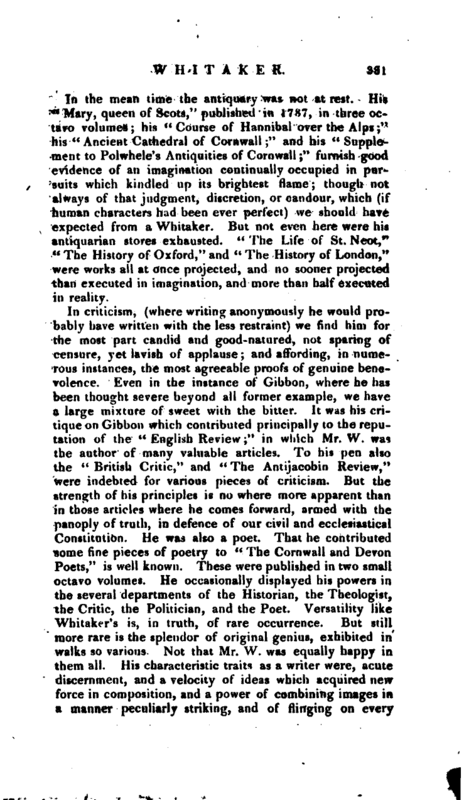 It was his critique on Gibbon which contributed principally to the reputation of the “English Review;” in which Mr. W. was the author of many valuable articles. To his pen. also the “British Critic,” and “The Antijacobiu Review,*‘ were indebted for various pieces of criticism. But the strength of his principles is no where more apparent than in those articles where he comes forward, armed with the panoply of truth, in defence of our civil and ecclesiastical Constitution. He was also a poet. That he contributed some fine pieces of poetry to” The Cornwall and Devon Poets,“is well known. These were published in two small octavo volumes. He occasionally displayed his powers in the several departments of the Historian, the Theologist, the Critic, the Politician, and the Poet. Versatility like Whitaker’s is, in truth, of rare occurrence. But still more rare is the splendor of original genius, exhibited in walks so various. Not that Mr. W. was equally happy in them all. His characteristic traits as a writer were, acute discernment, and a Velocity of ideas which acquired new force in composition, and a power of combining images in a manner peculiarly striking, and of flinging on every | topic of discussion the strongest illustration. With little scruple, therefore, we hazard an opinion, that though hi* chief excellence be recognized in antiquarian research, he would have risen to higher eminence as a poet, had he cultivated in early youth the favour of the Muses. Be this, however, as it may; there are none who will deny him the praise of a” great“literary character. That he was” good“as well as great, would sufficiently appear in the recollection of any period of his life; whether we saw him abandoning preferment from principle, and heard him” reasoning of righteousness and judgment to come,“until a Gibbon trembled; or whether, among his parishioners, we witnessed his unaffected earnestness of preaching, his humility in conversing with the poorest cottagers, his sincerity in assisting them with advice, his tenderness in offering them consolation, and his charity in relieving -their distresses. It is true, to the same warmth of temper, together with a sense of good intentions, we must attribute an irritability at times destructive of social comfort; and an impetuousness that brooked not opposition, and bore down all before it. This precipitation was in part also to be traced to his ignorance of the world; to his simplicity in believing others like himself precisely what they seemed to be; and, oo the detection of his error, his anger at dissimulation or hypocrisy. But his general good humour, his hospitality, and his convivial pleasantry, were surely enough to atone for those sudden bursts of passion, those flashes, which betrayed his human frailty, but still argued genius. And they who knew how” fearfully and wonderfully he was made," could bear from a Whitaker what they would certainly have resented in another. We should add, that in his family Mr. Whitaker was uniformly regular; nor did he suffer, at any time, his literary cares to trench on his domestic duties. Not many months before his death the writer of this article heard him speak of “Notes on Shakspeare,” and “Illustrations of the Bible.” But he wished to finish his “Oxford,” his “London,” and his “St. Neot,” (already mentioned as projected publications) before he resumed his “Shakspeare,” on which he had occasionally written notes; and, to lay aside his “Shakspeare,” before he took up his ’Bible." To the Bible he meant at last to withdraw himself from all other studies. 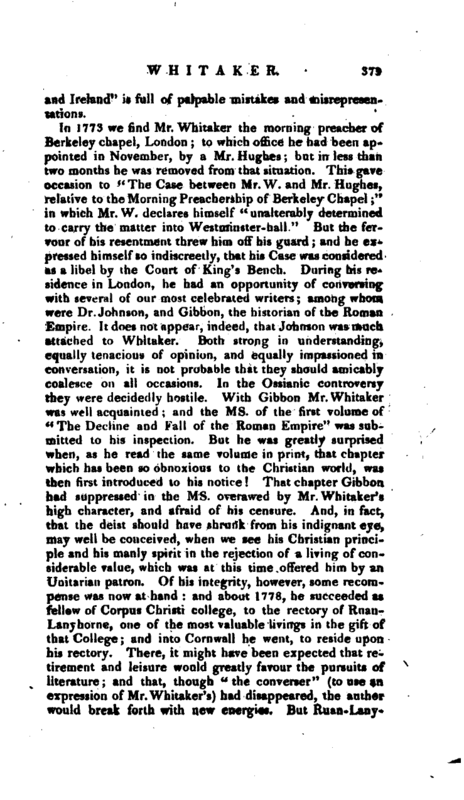 1 British Critic, Jan. 1810. —Gent. Mag. vol. LXXVIII.